Thai Red Curry with Tofu and Vegetables is a simple red curry, with goodness of tofu, mushrooms, broccoli and other vegetables. Here is how to make it. Thai cuisine is very flavorful and can be rustled up quickly. It does not require much cooking, letting the fresh flavors and taste envelop the ingredients. The cuisine is also very versatile, and use of healthy ingredients makes the food very nutritious. Thai curry is one of the instant curry recipe that I always end up making on the go in minutes. This thai red curry is one of those recipes that gets made using curry paste or paste, coconut milk whisked from fresh coconut, umpteen sauces and foods that is finely cook for minutes with the add of sauces. 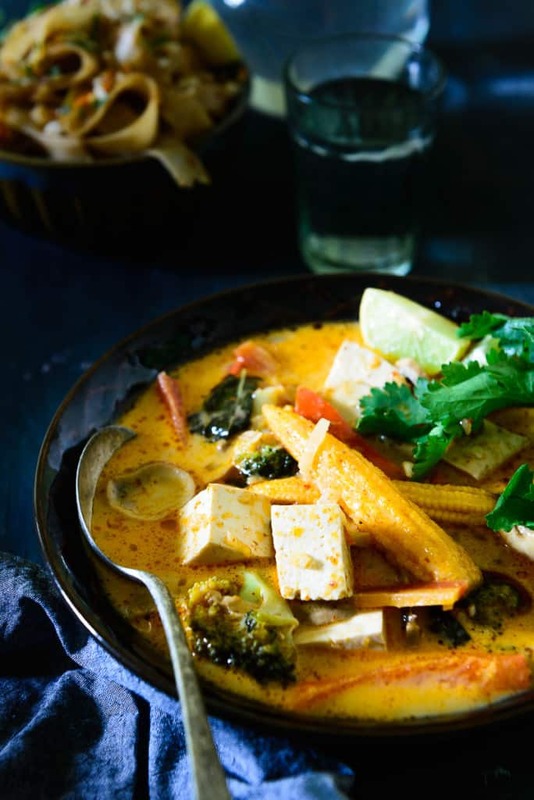 Thai Red Curry with Tofu and Vegetables is a simple red curry, with goodness of tofu, mushrooms, broccoli and other vegetables. It is light in flavor and on the palate and sweetish tangy. The lime juice and sugar (which can be replaced with jaggery), give a refreshing lift to this mild dish. The curry can be enjoyed with Jasmine Rice, or Thai Pineapple Fried Rice. This cuisine has some very mild curries. If you’re looking for a variation in non-vegetarian dishes, then Thai Green Chicken Curry and Thai Basil Chicken are good options. This curry can also be accompanied by a Spicy Thai Green Papaya Salad. 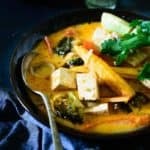 Here is how to make Thai Red Curry with Tofu and Vegetables. 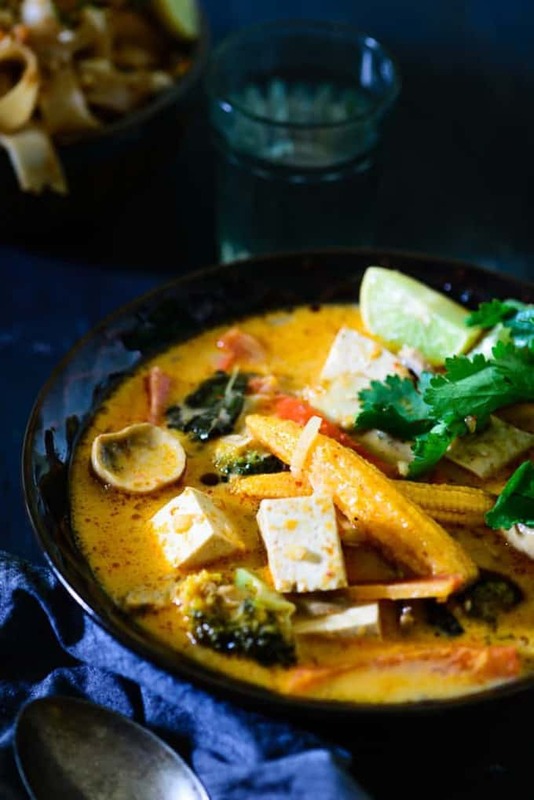 Thai Red Curry with Tofu and Vegetables is a simple red curry, with goodness of tofu, mushrooms, broccoli and other vegetables. Add garlic and fry for a few seconds. Add shallots and fry for a minute. Add red curry paste and fry for a minute or two. Add the broccoli, carrots, red bell pepper, mushroom, baby corn and tofu. Add coconut milk and a cup of water. Let the curry come to a boil. Simmer the heat and cook for 3-4 minutes. Add soy sauce, lemon juice, sugar and salt. Tear the basil leaves and add in the pan. Serve hot with Jasmine rice. Thnx a lot for trying and leaving your feedback.